First off, there is absolutely no reason not to read this. It’s free on a Kindle or whatever eBook reader you use and it’s so short I’ve read leaflets on high blood pressure that were longer than this. Most important though, it’s really, really good. 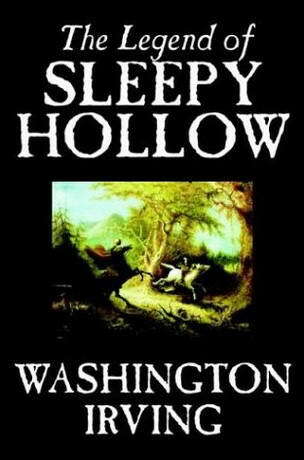 The story is set circa 1790 in the Dutch settlement of Tarry Town, New York, in a secluded glen called Sleepy Hollow. It tells the story of Ichabod Crane, a lanky schoolmaster from Connecticut, who competes with Abraham “Brom Bones” Van Brunt, the town rowdy, for the hand of 18-year-old Katrina Van Tassel, only daughter of a wealthy farmer. As Crane leaves a party at the Van Tassel home on an autumn night, he is pursued by the Headless Horseman, supposedly the ghost of a Hessian trooper who lost his head to a cannonball during the American Revolutionary War. One day I’m going to shock you all and not write this, but hey – the story is nothing like the blurb. My best friend threatened to have that inscribed on my grave once, which was slightly morbid but not entirely unjustified. Anyway, it’s more domestic than creepy. A large portion of the book is backstory, as Ichabod’s Crane’s history, demeanor and desires are described in great detail and then another portion is given over to his flirtation with a farmer’s daughter. Finally, the last little bit is the creepy bit, although the Scooby Doo version was scarier. No, really, it scared the bejeezuz out of me when I was about fourteen eight. Despite that, I did enjoy it. I would preferred a little more Headless Action but it was written in a wonderfully engrossing manner and every leaf and stone is described in amazing detail. I wish the mystery could have been wrapped up a little better, but the Horseman himself was sufficiently creepy. The dominant spirit, however, that haunts this enchanted region, and seems to be commander-in-chief of all the powers of the air, is the apparation of a figure on horseback, without a head. It is said by some to be the ghost of a Hessian trooper, whose head had been carried away by a cannon-ball, in some nameless battle during the Revolutionary War, and who is ever and anon seen by the country folk hurrying along in the gloom of night, as if on the wings of the wind. A quick read that’s definitely worth it, but don’t expect to be terrified! I am sooo picking this book up from the library for Halloween!!! I have this on my kindle and I was convinced it was really long so I haven't read it yet. But it would appear not and it sounds great so I will get round to it soon! Thanks!